Pour ¼ cup warm water into a one cup glass measuring cup or small glass. Add 1 tsp. of sugar, but don’t stir. Slowly sprinkle 1 tablespoon of yeast, and again, don’t stir. Wait 10minutes until the yeast becomes thick and foamy. In a bread bowl, mix the 3 cups water, 1/3 cup sugar, ¼ cup cream, 2 eggs, ½ cup corn oil and salt. When the yeast is foamy, add to the bread bowl and mix. Add 1 cup of flour to coat the bread. Add the rest of the flour one cup at a time, working it in after each addition with your hands. You should have a soft pliable dough. Turn out the dough on a floured surface and knead until smooth and elastic. Kneading involves using the palms of your hands pressing down across the dough, picking up and repeating for at least 10minutes which is about the same time you have worked off all the pent up frustration you have been carrying around allday. Wash your bread bowl, dry and lightly grease with vegetable oil. Place your dough in the bowl and flip over so the top will be oiled. The dough is ready to rise. If your oven is not in use, the best place to let dough rise is in your oven. Place a skillet on the bottom rack and fill with boiling water. Place the bread bowl on the rack above and close the door. You will need to let the dough rise for twohours or until doubled in size. Punch down the dough and place on a floured surface to roll out. 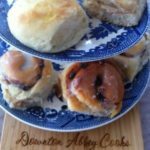 Portion the dough with a dough cutter (or knife) to make a variety of traditionalEnglishsweet buns. An Abbey Cook is very skilled at multi-purposing her dough.